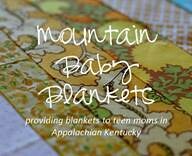 my new friend, rachel, contacted me earlier this week to see if i'd be interested in donating blankets to babies in need in appalachian kentucky. i can hardly stand the thought of cold, blanket-less babies, so i'm off to make some receiving blankets. if you are interested in helping, feel free to contact rachel via her blog. i'm on my way over there now. we can't have cold babies out there...that just breaks my heart just thinking about it. This certainly is a nice gesture...I will go now and check it out...thanks for the link! Thank you so much for posting, too! Very nice of you. Glad to have your help. thanks for spreading the word. am off to sign up too. I just found you and wanted to say that I also just found Rachel this morning. I'm signing up to make things for those children too and have posted something on my blog about it as well. Love your bright green quilt!! thanks for posting about this...i had no idea about this little community. i just had my little baby a week ago and not getting around normally yet. otherwise i would love to be helping with the blankets. i hope they get a lot of help! 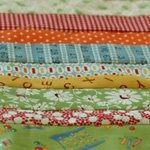 I love all the quilts that you make and doing charity quilts is wonderful. Here in Canada, we do the Hospital for Sick Kids in toronto which loves to get small quilts! Of all the quilts you have done, I love the Candy Corn quilt the best. I don't know why, but it's my fav!